You are currently browsing the tag archive for the ‘Artistic Fraud’ tag. I met Jillian Keiley though the Diploma in Performance and Communications Media and she’s kept me stunned ever since. In a good way. She’s always up to something, and not just something – something damned interesting. The entire team of people that contribute to Artistic Fraud do so using each of their own talents and it always blends seamlessly in to a final product that seems effortless. Though, I’m sure most know the difference. The production company’s next presentation fills those big shoes and gets back to the heart of the matter. What’s Fear of Flight about? The basic story is the journey of 14 people on board a plane and how they go from one place to the other. The play is really about fear. Some people on the plane are afraid; some have no fear of flying, but are afraid of events in their own lives. We see how they take off, challenge the fears and if they resolve them. Who are the main people on the flight? The original piece had 30 students from Grenfell College; in that production we focused on the stories of nine characters. In this production we’ve cut the passengers down to 14, but now we get to know everyone. You think about a plane in the sky or a plane crashing with all those people onboard all we can think of is the magnitude of the number of people on board. It’s difficult to break that down to all of those lives that were onboard. Although this is a big chorus and big ensemble show, it’s really important that each player is fully developed, intricate, recognizable and individual in character. How did this show come together? Maybe 10 years ago, Torquil Colbo and I discussed a musical on an airplane that had a passenger chorus. It started out with two pilots marching down a line singing “We are the pilots! Nous sommes les pilots!” Somehow this piece spun out; now it’s nothing at all like the original idea. One of the neat things is that each of the passengers is written by a different author- so just like on a plane, each character has a totally individual voice. We had some of Canada’s best playwrights, and feel pretty lucky to have such varied and excellent characters; they’re really great; funny, sad, wonderful. Robert Chafe took the monologues that we commissioned and blended them together. What really prompted the kernel idea for this production? I’ll admit that I have suffered heavily from a ‘fear of flight’ since I was young. The first time I flew was to cadet camp in New Brunswick. For some reason I ended up on a government plane and was seated next to a pretty recognizable politician – I think it was John Crosbie. Anyway, we hit some turbulence, and I actually threw up on him. So, how’s Artistic Fraud getting back to its roots? 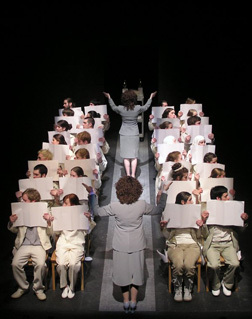 We’ve been developing a way of creating shows since 1995 using big groups and large choral movement. For the past few years, we’ve been concentrating on smaller shows, with anywhere from one person to seven. Our original pieces had anywhere from 45-81. It changed when we became a professional company- it became difficult to pay for a large cast. We’ve prioritized large casts again and refigured our budgets and made it happen. It’s pretty gratifying. How was the soundscape developed for this show? It’s one of the most interesting elements, the choreography is pretty elaborate and was written around tunes that I picked which matched characters as they were speaking – we did this fun thing making it what was on their headphones. In the original we used Miles Davis, from the 80’s Hold Me Now, some classical pieces. The new score was commissioned from Jonathan Monro who’s a genius. He took the original choreography and wrote new music that fit the same timing and climaxes, big rests and large accents. Then I was able to blend the original choreography with some new more complex pieces. It was a fantastic way to work and how his brain put that all together, I’ll never know. What kind of reaction have you gotten so far? The workshop version from Grenfell was very successful and played Magnetic North. A lot of artistic directors saw the show- and in fact we were invited this year to bring the piece to a Moscow theatre festival. We didn’t have enough notice to make it happen but it was nice to be asked. There are several presenters and festivals coming to the Hall to check it out for programming in their own seasons. It looks like the show can travel and we’ll hope to tour the mainland and beyond next year. Who can we look forward to seeing on stage in Fear of Flight? It’s a big choral show- the music is gorgeous – it’s all a capella singing so it’s a very fine listening experience. The choreography is pretty neat and the text is just great – it’s the actors who are the superstars of this show, they sing, dance and act but it’s not like a musical exactly. You’ll really just have to come see it! Fear of Flight prepare for take off! If you were to pick a character that was most like you, who would it be? I think Dennis, played by Andrew Dale, might reflect my own journey through my fear of flying – he starts paralyzed by his fear and eventually manages to conquer it; I say the show is about fear but its not really, it’s about courage. For people who are afraid of dogs it’s very courageous for them to pet one. For people who are afraid of speaking in public it’s very courageous to take a role in a play. I love dogs and theatre – doing that stuff means nothing to me; but getting on a plane used to be horrifying. I fly for my living these days, though I wish I could be home more. But I somehow had to shake this thing- I took all kinds of drugs, lots of airplane booze, different kinds of solutions. But eventually I just had to force myself to give it up or give up my job. So I gave in and now even enjoy flying a bit. I think of all the things I do that takes a bit of guts, one of the things I’ve done that I’ve been most proud of is, actually just getting me on a plane. Next year I’ve got a job in Tasmania, and I’m ready to go for it. How can people check out Fear of Flight? The show opens April 29th at the LSPU Hall and runs till May 11th. It’s at 8pm and there’s a PWYC matinee at 2pm on the 4th of May. Something fun to wrap it up, f you could be any one of your favourite childhood toys, what would it be and why? I had a little stuffed dog that I carried around till it rotted. I suppose that I wouldn’t want to be it right now, but in its glory days this dog a little brown stuffed dog had the best life, very lackadaisical. I could go for that I think.